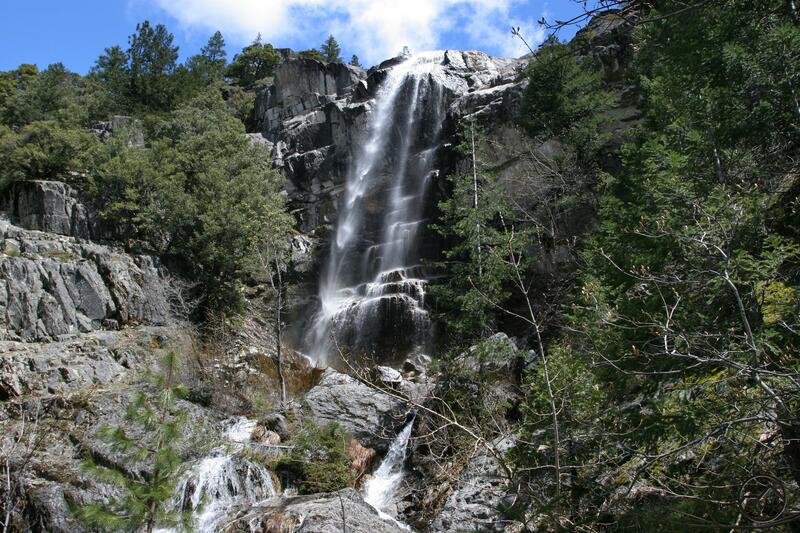 A moderate hike along the PCT to a great waterfall nestled in a narrow canyon in the Castle Crags. Burstarse Creek cascades through a granite sluice. Granite spires of the Castle Crags, seen from the PCT. 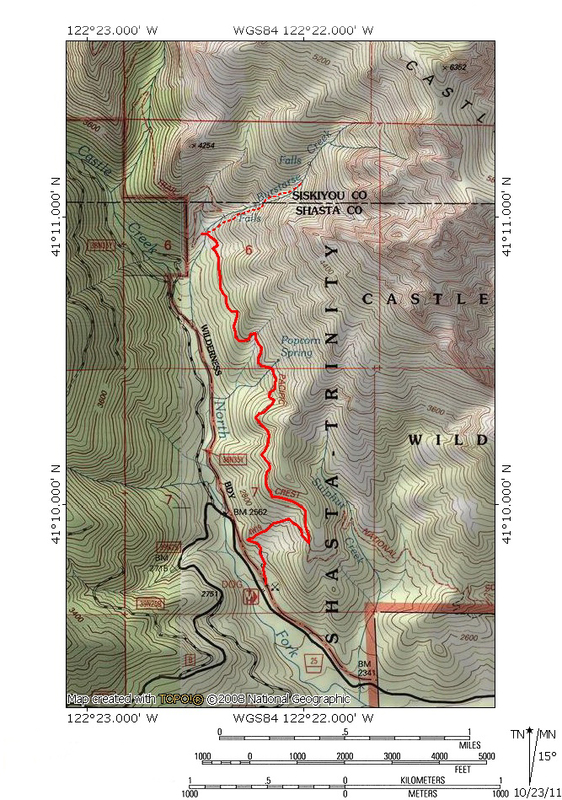 The route to Burstarse Falls begins at the Dog trailhead, just off of Castle Creek Road. The trailhead is marked with a sign for the PCT. The east half of the parking clearing is often used as a firing range, so be sure to park on the west side if possible. The Dog Trail connects to the PCT in 0.5 miles. It is so named because people hiking the Pacific Crest Trail in the company of dogs use it. To the east of the Dog Trail, the PCT passes through Castle Crags State Park, which does not allow dogs on its trails. The Dog Trail thus provides a bypass through the park. Unfortunately it also bypasses a lot of great scenery. Although the trail climbs at a moderately steep grade (nearly 600 feet in 0.5 miles) this is the steepest part of the entire trip to Burstarse Falls. When the trail intersects the PCT, head left, to the west. If one continues east for 0.8 miles to the east fork of Sulphur Creek, it is possible to find the climber’s trail leading up to Beck’s Tower and the Marble Gully, one of the premier climbing areas in the Castle Crags. 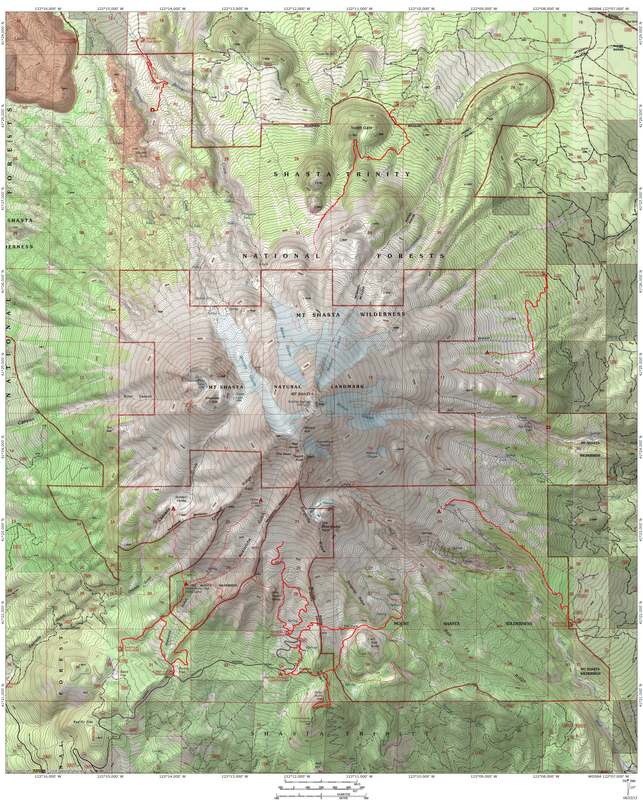 Continuing west on the PCT, the trail maintains an even grade for 1.75 miles. 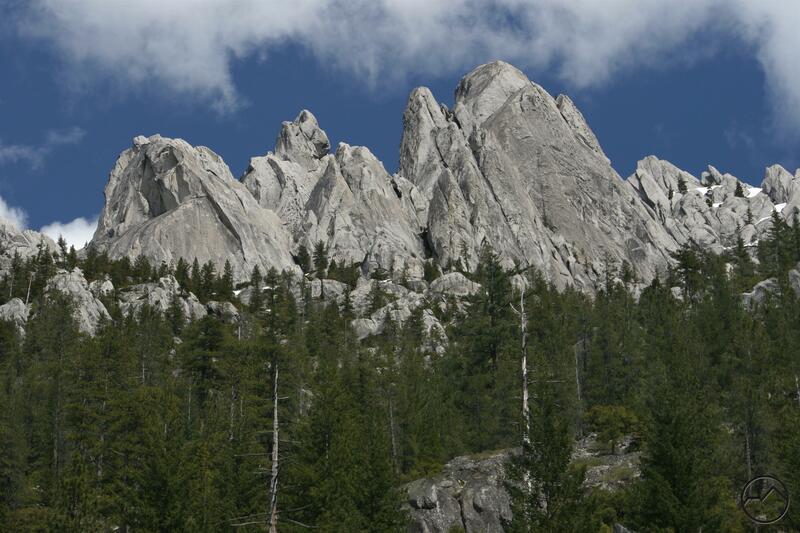 Occasional views of the granite spires and domes of the Castle Crags, as well as distant glimpses of the Grey Rocks, are available when the trail passes through clear areas. The trail passes over a few seasonal creeks. The only reliable water is at Popcorn Spring, about halfway between the Dog Trail junction and Burstarse Creek. After repeatedly scalloping through a seemingly endless series of drainages, the PCT finally arrives at Burstarse Creek. Although there is a wooden sign hung on a tree identifying the creek, the confluence of another, smaller creek at the trail crossing, as well as the interesting granite chute through which the creek descends are also sure signs that one is now downstream from the waterfall. As noted above, the PCT crosses Burstarse Creek at its confluence with another, smaller creek. Later in the season the smaller creek may be completely dried up. Immediately above the confluence there is a ten foot tiered cascade. This only presages bigger things upstream. From the PCT, a faint use-trail branches off to the right and parallels the creek on its east side. 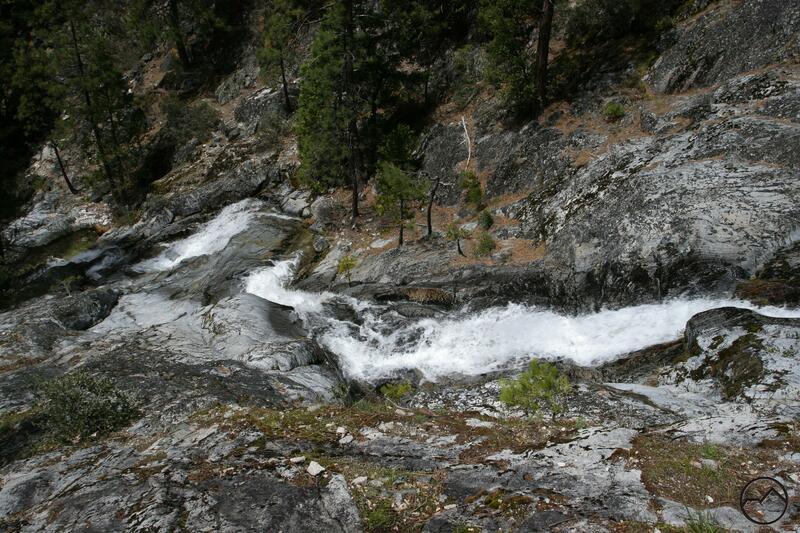 Above the initial cascade, the creek courses through a series of granite channels and troughs. This area is very reminiscent of creeks in the Sierra. Beyond the channels is the first big waterfall. 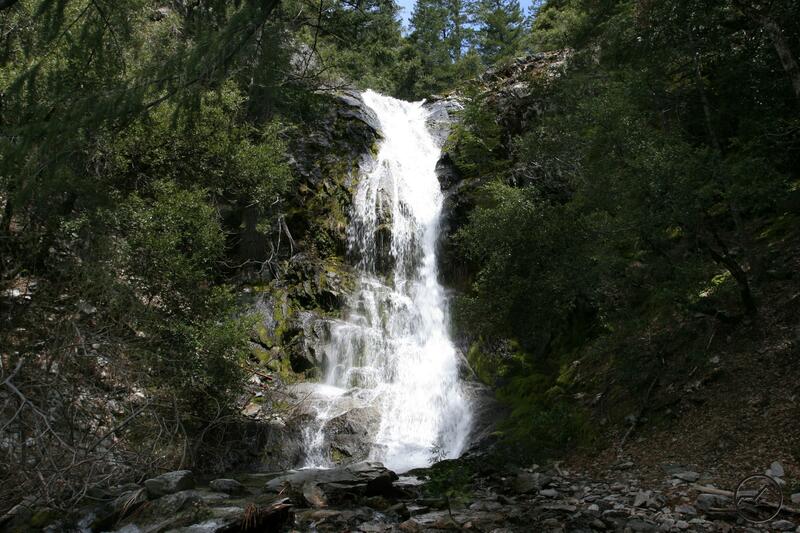 About 25 feet high, it is sometimes referred to as Lower Burstarse Falls. Many stop here, thinking that this is, in fact, Burstarse Falls. The trail becomes much fainter at this point, as it passes under some low hanging trees and through some brush. Staying on the east side of the creek, climb above the falls and continue up the narrowing canyon. Once beyond the lower falls, the east side of the canyon becomes too steep to pass. Cross over the creek and continue up the canyon. Soon it will be possible to cross back over to the east side. At this point, Burstarse Falls finally comes into view. The falls rockets off of the cliff and free falls about 50 feet onto a pile of rocks below. A series of cascades below the falls adds to the beauty of the area. Return the way one came to the PCT and thence to the trailhead. 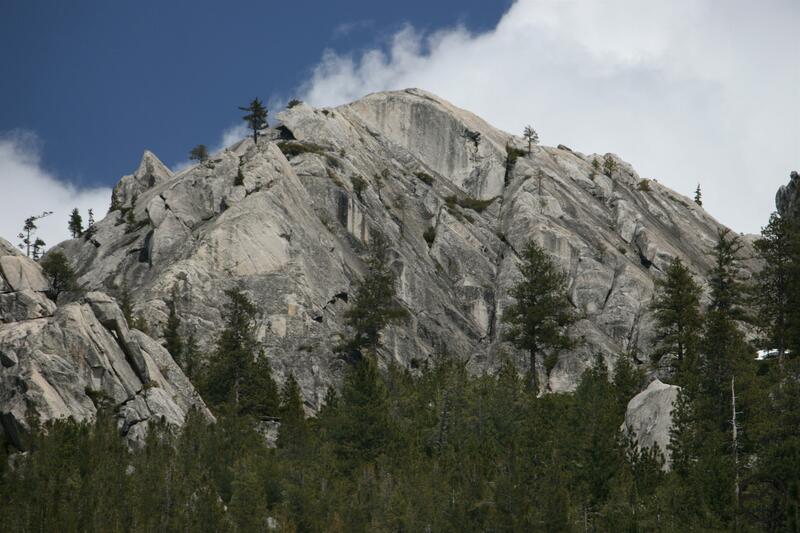 A granite dome of the Castle Crags rises above the PCT. From I-5, take the Castella exit. Head west on Castle Creek Road for 3.3 miles. Turn right into the clearing that serves as a parking area. A PCT sign marks the parking area. Drought update: I hiked there yesterday August 21, 2015 and found there to be no flowing water. There were some standing pools of water but nothing was flowing. What a beautiful hike. The water was flowing good still June 5 2017. Enjoyed jumping in one of the pools of water.